Thomas B. Felder, the attorney, left Atlanta for Cincinnati Sunday afternoon to be away from the city on a business trip for several days. 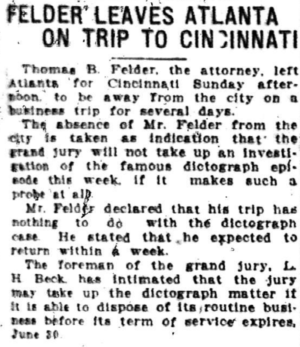 The absence of Mr. Felder from the city is taken as indication that the grand jury will not take up an investigation of the famous dictograph episode this week, if it makes such a probe at all. Mr. Felder declared that his trip has nothing to do with the dictograph case. He stated that he expected to return within a week. The foreman of the grand jury, L. H. Beck, has intimated that the jury may take up the dictograph matter if it is able to dispose of its routine business before its term of service expires, June 30.